By day, Mindy pretends to be a technology executive for an enterprise software vendor when she would rather be writing. She spends her free time consuming large amounts of coffee, traveling and doing a bit of volunteer work. She is an exercise enthusiast, loves both indoor and outdoor activities, and devotes an unhealthy amount of time spoiling Zoey and Samson. She lives with her husband, Kevin, and two step daughters, Anna and Melissa. Mindy Levy offers readers a candid look at her family. She readily admits that there are two important F words in her life, Food and Family. Mindy’s family is Jewish. Even though I had read about some of the Jewish holidays and traditions, reading this book quickly showed me how much I did not know. Every event seems to surround food. Mommom is Mindy’s grandmother; when she was extremely hungry she would say, “I’m not very hungry” and then she would eat everything in sight. Mindy’s mother collects a keepsake from the table when they eat out: it could be a butter knife, salt and pepper shakers or the small coffee creamer. Laughter seems to be the bond that cemented her family together. It is amazing how laughter can make a difference in a family. When Sarah accidentally threw her two diamond rings down the garbage chute she hysterically called Mindy for help. After Mindy found the rings Sarah laughed hysterically, admitting that she would not have done the same for Mindy. Life as a step-mother is even funnier. This book will have readers laughing out loud. I have only shared a few of the antics Mindy writes about. Life often takes us by surprise; we can become upset or we can laugh. I prefer Mindy’s method for handling life in general. Mindy and her whole family laugh and they have plenty to laugh about. 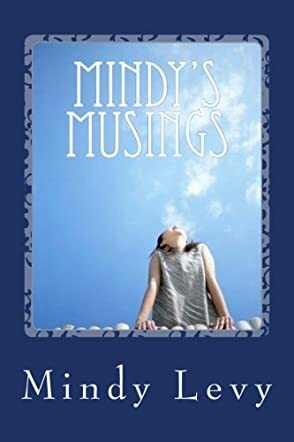 "Mindy’s Musings" is an enchanting read. There are only 63 pages in this book but each page is filled with real life happenings that will keep the reader smiling if not laughing. Author Mindy Levy has a lovely manner of storytelling.